Look-y here. I’ve managed to make you something that isn’t breakfast. I’ve apparently been on one serious breakfast-y kick. I’ve been turning out waffles, quiche, and smoothies galore. I point out the fact I’m bringing you something non-breakfast since I am pretty sure tomorrow (or at least soon) I am posting something breakfast-y. Sorry (not really). So…yesterday got weird. Mostly because I’m me and can’t seem to stay off the internet no matter how terrifying it can be. I had a weird tingle in my leg, which I promptly Googled (bad move). Don’t do this, friends. Don’t Google every twinge or tingle or pain that happens in your body just because you can. I’ve been telling myself this for years, but I can’t seem to take my own advice. When you Google a symptom, no matter what your symptom is, it usually leads to “OMG, I AM DYING!! !” Since I was experiencing a weird leg tingle, the sage and soothing advice of the interweb made me believe that I was probably, most likely, right in the middle of a stroke. Things got dramatic. I started pacing back and forth, thinking “OMG. I am having a stroke. This is not good. This is extremely bad.” The dog looked at me suspiciously and without major concern. Aren’t dogs supposed to be sympathetic? Geez. I needed to be talked off the ledge and the dog’s cavalier attitude led me to believe she was not the one for the job. I called my mother. “Mom, I am fairly certain,with the advice of the internet, that I am having a stroke.” It turns out that if you have the where withal to call someone semi-casually, and the strength to pace your hallways over and over, you are probably not having a stroke and most likely just have some sort of pins and needles situation from sitting on your leg for too long at the computer. You are however, probably in the middle of a WebMD-induced panic attack. After a pretty grandiose freak out, some light tears and some heavy breathing, I managed to pull myself together. Long story short…WebMD is not a real doctor, Moms are good people to call when you are having non-strokes, and I can be an over-dramatic hypochondriac. This is my real life brain in ultimate crazy-mode. It happens. We all have our things. I tossed the mixture with my fingers, making sure that all of the florets were covered with the olive oil and the garlic mixture. I roasted the cauliflower until it became tender and golden brown. This gives it a lovely, nutty taste. 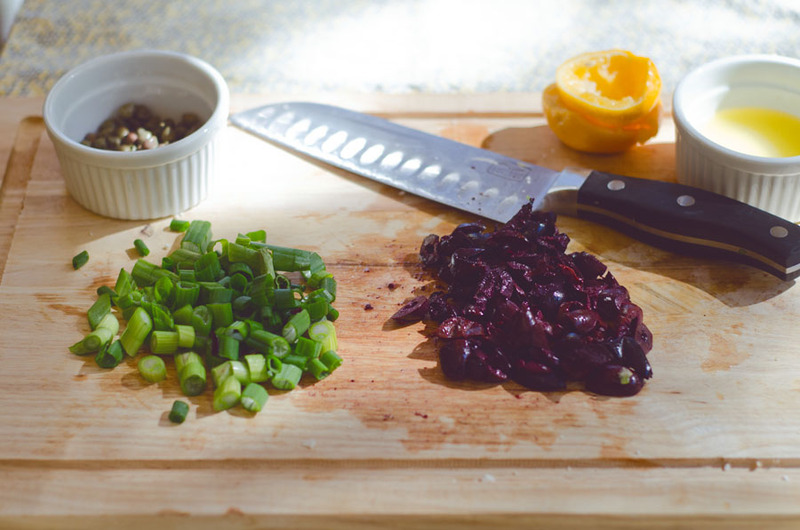 I indulged in a little more chopping therapy, and minced some kalamata olives and some green onions. I measured out capers and juiced a meyer lemon. Once the cauliflower florets had cooled enough to be handled, everything went together in a bowl to mingle and get cozy. I tossed the mixture again with my hands. There is something therapeutic about using your hands. It’s the same feeling you get when you are kneading biscuits. It just makes sense for me. I topped the whole mixture with a couple more tablespoons of olive oil. I filled a plate up with fresh spring mix and put a generous helping of the cauliflower mixture on top. You don’t even need to dress your greens, because the olive oil and the lemon juice mixture will seep down into them. The whole mix is packed with flavor. No salt is needed, since the capers and the olives pack a salty punch. I grated a bit of freshly-cracked black pepper over the top just to add a little bit of a kick. 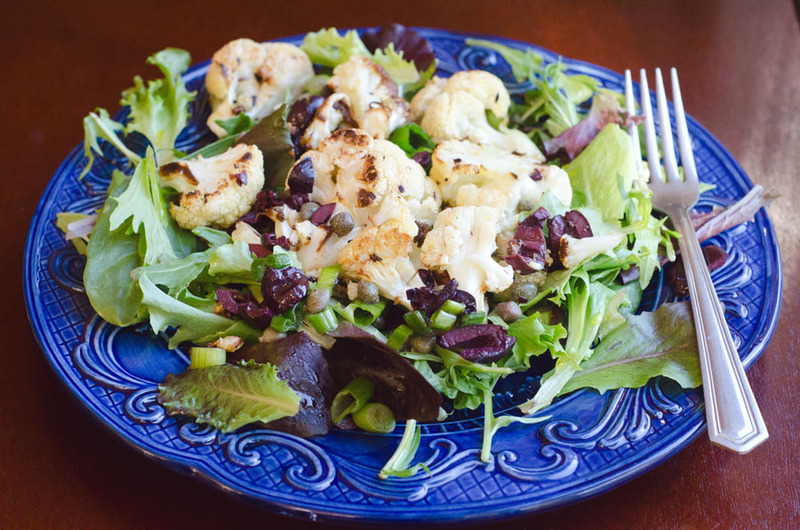 This dish is simple, clean and completely satisfying. Be cool, eat your veggies, and lay off the internet medical advice. High fives all around. Disclaimer: The nice people at Copper Hill Olive Oil sent me some samples for recipe development and testing purposes. However, all opinions are my own. 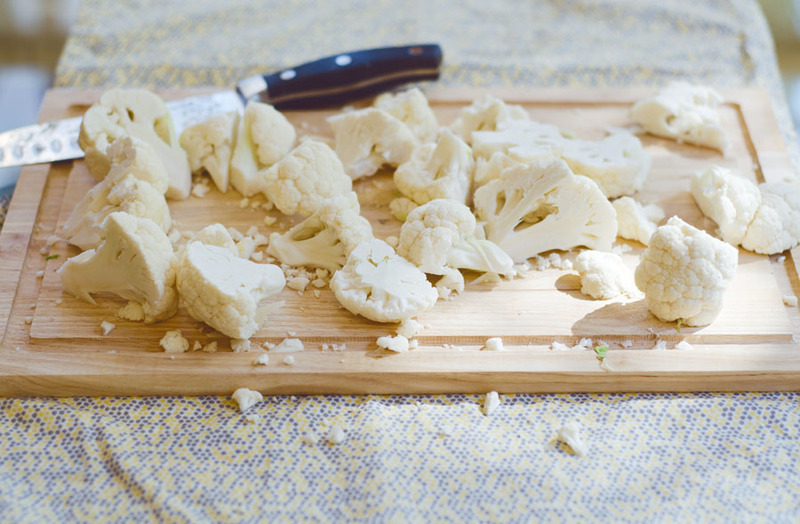 Remove the stem from your cauliflower and chop up into florets. Mince your garlic and add into a medium sized mixing bowl with your cauliflower florets. 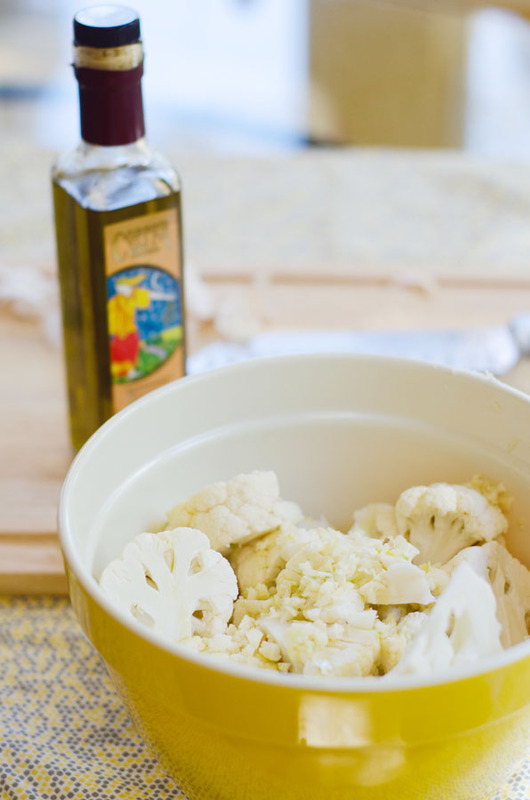 Add in two tablespoons of your olive oil and massage with mixture with your hands until the cauliflower is completely coated and the garlic is also distributed evenly throughout. 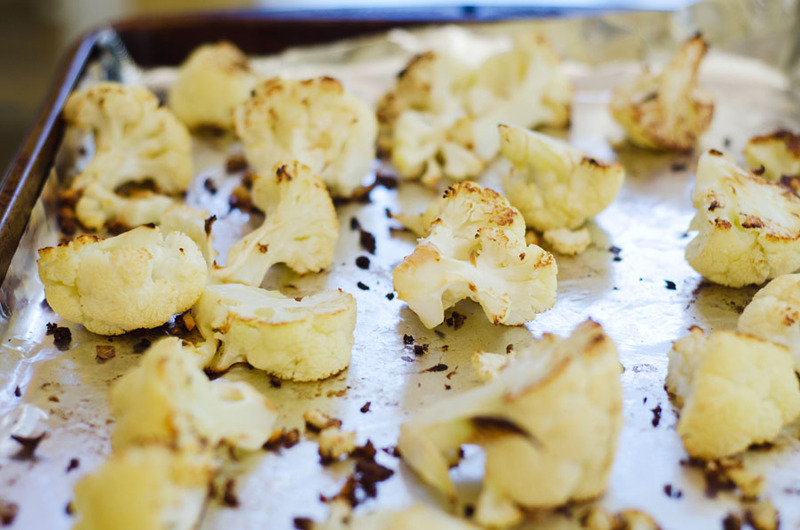 Lay the cauliflower out flat onto your aluminum foil lined baking sheet, and pop into the oven for 10 minutes. 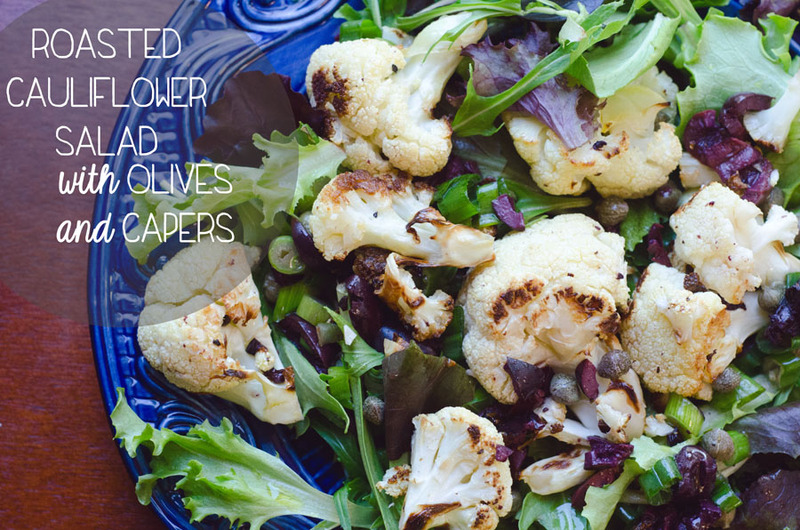 Once ten minutes has gone by, remove the cauliflower from the oven and flip each piece. Put the pan back into the oven for 10-15 minutes or until your cauliflower is fork tender and lightly golden brown on the edges. 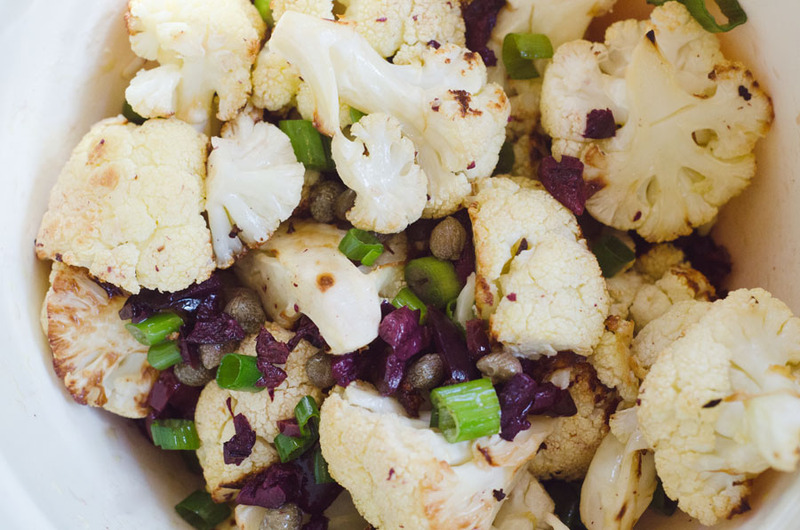 While your cauliflower is baking, prepare your other ingredients. Chop up your olives and your green onions, juice your lemon, and measure our your capers. When the cauliflower is cool enough to handle, put it back into your mixing bowl with your other ingredients and using your hands mix together. Top with the remaining 2 tbs of olive oil and mix again. Serve over a bed of spring mix and top with freshly cracked pepper. This made me crack up! Aw, jeez. We TOTALLY need a set of Encyclopedias. STAT.